I’m so excited to share this with you. One of the most naturally beautiful places in the world to me is Iceland. My daughter is currently going to school there for a semester. On the weekend she went on a historic tour of Iceland with a professor and other students from the Icelandic University. 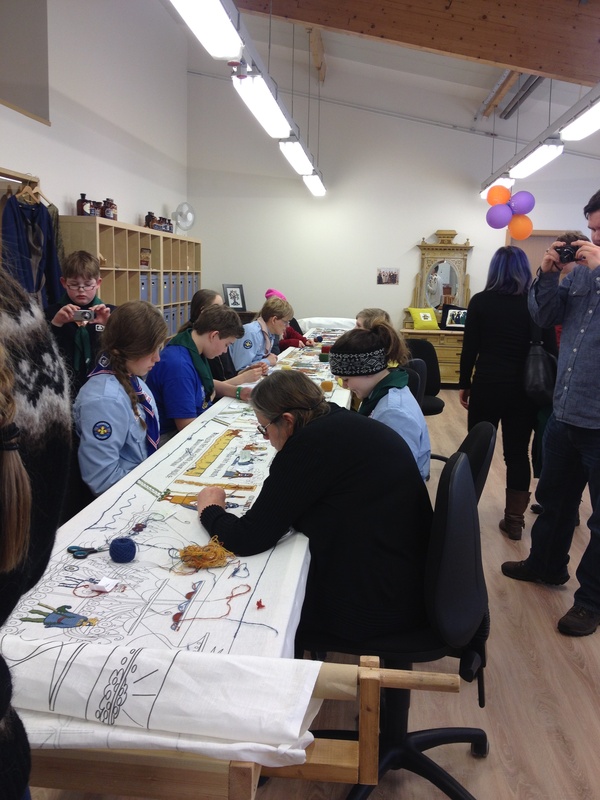 During the tour they stopped at museum where the Tapestry of Iceland is being created. The above photo is of some people stitching the tapestry. While my daughter was waiting for lunch, she saw the tapestry behind a window. A woman asked her in Icelandic if she would like to stitch a thread into the tapestry. My daughter was first surprised that she understood the Icelandic and that she was asked to participate in such an honor. She was the 3041 person to stitch thread into the Tapestry of Iceland and also got her name recorded! What excites me about all this is the history being woven, and being woven into Icelandic history. The tour was focused on some of the history of Iceland being told through a Saga, the history and saga were as one woven together. What also amazed me is that there are physical landmarks still in Iceland today that were a part of the history and Saga being told today. The Saga’s and their physical landmarks are kind of like an Inuksuk of Icelandic history. The significance of the tapestry and so many people coming together to weave it reminds me so much of the Tibetan Story Scrolls, Thanka paintings. In Tibetan history, there were holly men that walked from village to village with these ancient and sacred Story Scrolls. They would stop at this village or that, roll out their scroll and start telling the stories, the history and spirituality all woven together as one, and they would tell the stories for hours. At the end, tears would be streaming down the listener’s faces for something sacred was transmitted. That’s exactly the word that a Chicago dancer I met in Canada many years ago used when referring to the sacred and ancient dances of Tibet, “transmitted”. He said that the dancer would become the deity and in that process transmit the spiritual teachings to the students. I believe something similar and miraculous happens with the Thanka’s, the Story Scrolls of Tibet. I wonder if that kind of magic and mystery is being woven into the Tapestry of Iceland, and for that matter other tapestries, or Story Scrolls that we create with friends, family, and community. Look at quilts for example; often many hands and many stories have gone into their creation. When I used to teach through story in schools in Canada, I would have the children create their own Story Squares. In groups of 3 or 4 they would draw a story onto a large square cloth and then be able to tell and share it with the rest of the class later. One of my favorite memories is walking into a school and seeing the Story Squares hung like large prayer flags from the hallway walls. Whether drawn or sewn, weaving ourselves and our history into cloth, we become aware how we are all threads woven together in the Great Tapestry of Life.